The purpose of this study is to investigate the association between dysfunctional relationship beliefs and marital conflict of nonclinical married individuals. Interpersonal Cognitive Distortions Scale and Married Life Questionnaire were completed by a sample consisting of 182 married men and women. 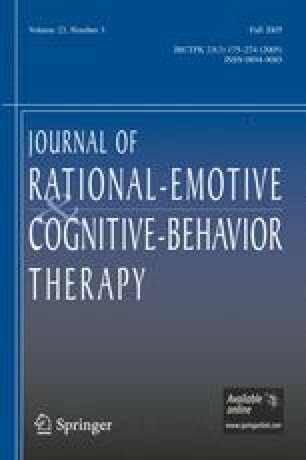 As hypothesized before, dysfunctional relationship beliefs correlated positively with the number and frequency of marital conflicts and the level of tension felt related to such conflicts. Dysfunctional relationship beliefs indicated the highest correlations with the frequency of marital conflicts. The beliefs related to mind reading were negatively associated with marital conflicts of women. When individuals endorsed high dysfunctional beliefs, they experienced more conflict in their marital relationship and felt more stressful. In addition, individuals experiencing conflict on 10 out of 30 issues had high level of dysfunctional beliefs. In conclusion, the results of this study have demonstrated the negative consequences of dysfunctional beliefs on marital conflict. Note: The scale was constructed in Turkish. The English version of ICDS is not a backward translated version of ICDS. It was presented for illustration purposes only.